It wasn’t too long ago that Brian and I were having one of those lovely Brooklyn days that reminds you of why you live here. We started off at the Grand Army Plaza Greenmarket, walked through Prospect Park and then zigzagged our way though the streets of Park Slope, Carroll Gardens and Cobble Hill. Near the end of our journey we stumbled upon a small antique sore that was curated much better than most, Brownstone Treasures. A lot of things caught our eye, but we picked up two distressed metal bins, knowing that we would do something with them (though we weren’t sure what). One ended up being a great place to stash some magazines, while the other went to work in the kitchen. 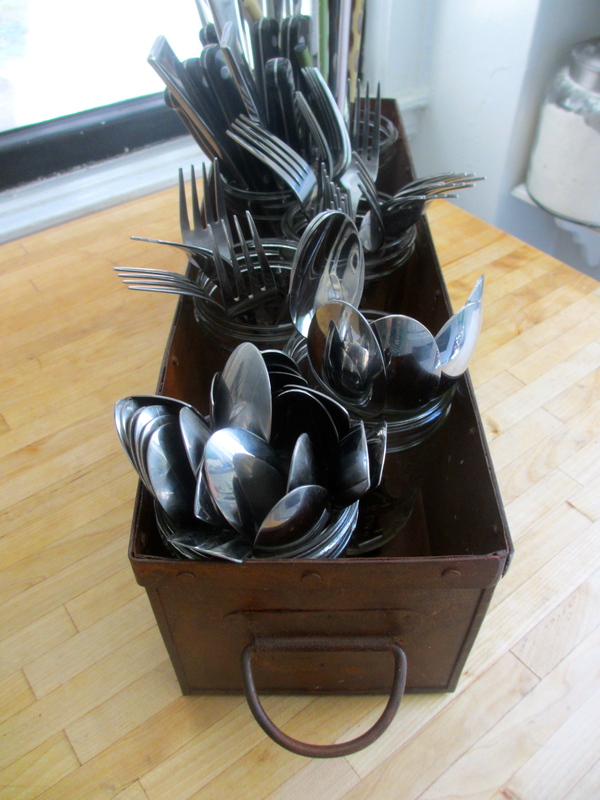 I filled it with six Ball jars, just enough to separate out all of our utensils. It’s a great help when we have dinner parties and need to carry a bunch of silverware to the dining table—we just pick the whole thing up and go. It also works well when we’re entertaining dinner guests in the courtyard—once again, we just pick up the whole thing and go. My favorite benefit has turned out to be that I can grab a spoon or fork without having to open up a drawer and possibly dirty a handle while I’m cooking. Everything is right at my fingertips, just the way I like it. If you’re in the neighborhood, definitely check out this spot and see what kind of goodies you can find for your own home. This entry was posted in Out and About and tagged @SWWUblog, antique store, antiques, ball jar, brooklyn, brownstone treasures, cobble hill, DIY, home decor, metal bin, out and about, park slope, unique storage solution, utensil caddy by Something We Whipped Up. Bookmark the permalink.